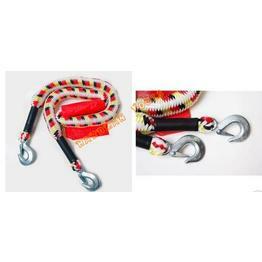 Key Specifications/Special Features: Details of car tow rope with strong hooks 100% Brand new and high quality. A must item for drivers when they get stuck in the mud, sand or snow. Perfect design for helping to tow your beloved car away from the place where it breaks down. Used to rescue stuck or disabled vehicles. The forged hooks with safety latch can prevent it from falling off the car and make it easier to take off or put on. Compact, convenient & easy to use. Pull Capacity: 2 Tons. Size: 4m.